Whether we’re religious or not, churches are often on our travel must-see lists because of their architectures, the art pieces they house, and the important part they play in the culture of the places were are visiting. Some churches are world-famous — La Sagrada Familia, the Sistine Chapel, Hagia Sophia — while others are not as well-known but definitely worth checking out. Here are seven amazing churches you didn’t know existed but that you should add to your itineraries. 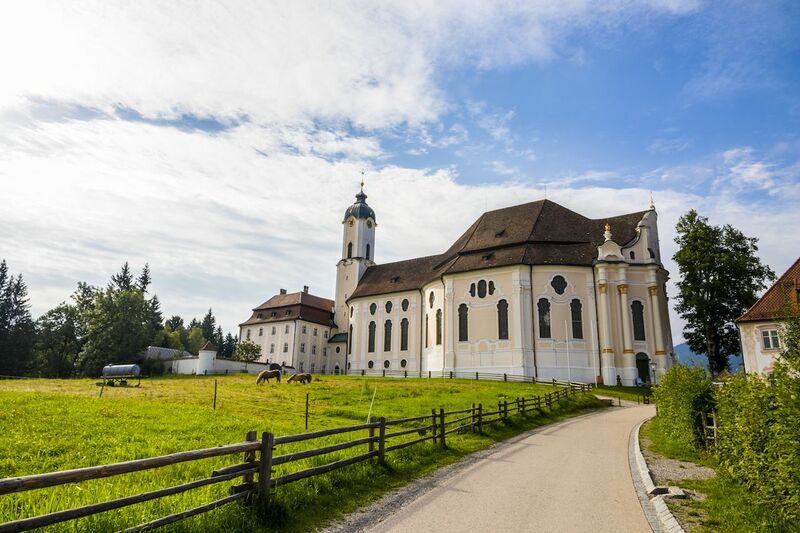 From the outside, The Pilgrimage Church of Wies looks almost ordinary. It is not overly ornate and it’s painted a very nondescript off-white. And because it is located in a rural, alpine setting, right beside fields of cows and horses, you’d never expect what goes on inside. 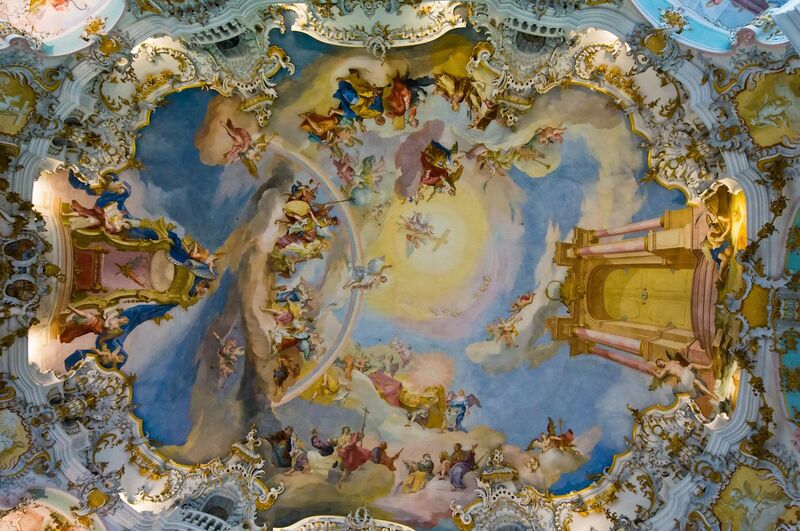 As soon as you walk in, you’re hit by a rococo, over-the-top, oval room that will have you gasp. Nowadays, we would qualify this type of decor of bad taste, but back in the mid-18th century, exuberance was in. 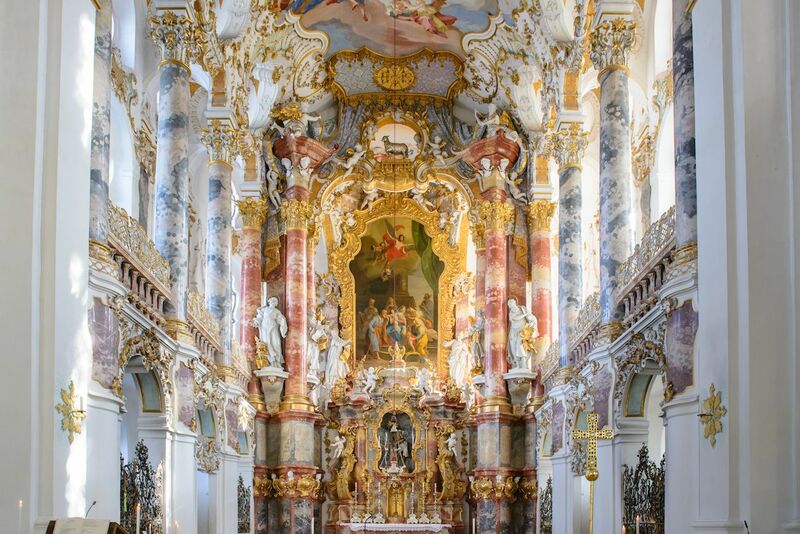 The colorful frescoes and sculpted details make the whole church very bright and cheerful — nothing you’d expect from a 260 year-old German church. You can check out this church every day from 8 AM to 8 PM in the summertime and from 8 AM to 5 PM in the winter. You cannot visit the church when there’s a service on, so have a look at the timetable before you barge in. 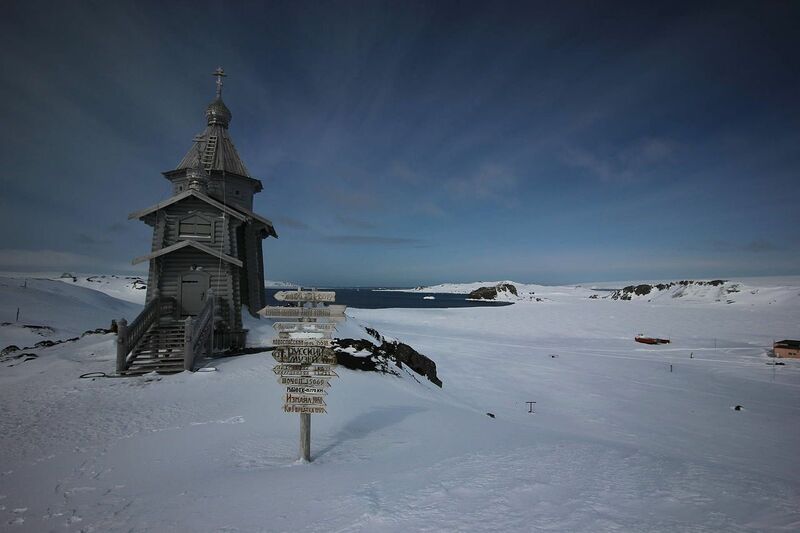 Trinity Church is the southernmost Russian Orthodox church in the world as it is located on King George Island in Antarctica. But the geographical location is not the only thing that’s unusual about it. The tiny, fragile-looking, wooden building that sits atop a rocky hill with a view of the Bransfield Strait was made of Siberian pine tree in the Altai, a region of Russia that borders Kazakhstan, China, and Mongolia. The church was first assembled there, the pieces numbered, and it was disassembled to be shipped to its current location in 2004 where it was assembled again. 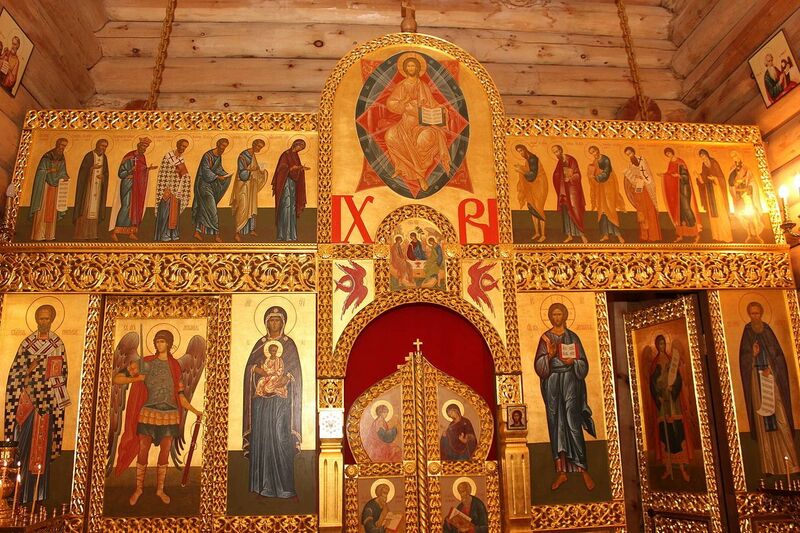 Trinity Church, although rustic and dark on the outside, is very ornate inside as it contains a large, golden iconostasis (a wall of religious icons and paintings) that you wouldn’t expect to find in the confines of the most remote continent on the planet. 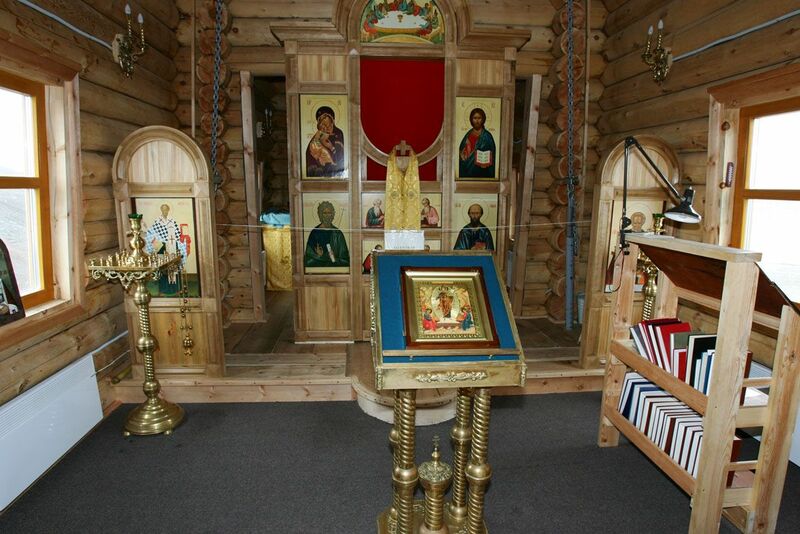 Despite the fact that it was built for the needs of the staff of Russia’s Bellingshausen Polar Station, anyone who travels to King George Island can visit Trinity Church and some may even be able to get married by one of the two monks who rotate to keep the facility functional year-around. The Orthodox Christian churches of Lalibela in Ethiopia are quite a sight. They were carved out of red, volcanic rock between the 10th and the 13th century to create a sacred site. 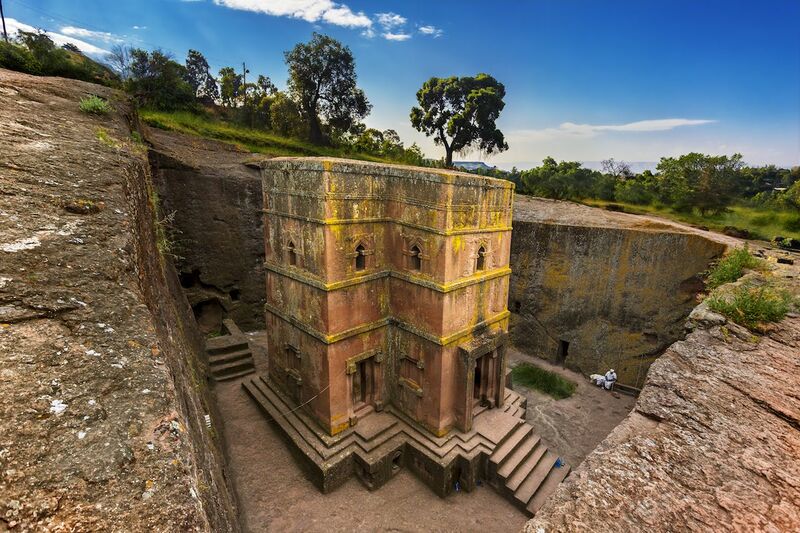 There are eleven rock-hewn churches in Lalibela, but St. George is the one that stand out the most. 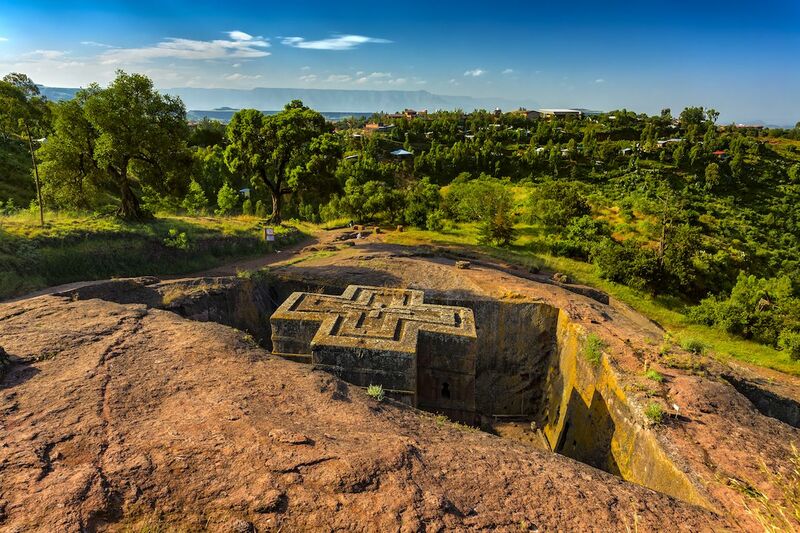 The monolithic Church of St. George (the patron saint of Ethiopia) is shaped like a cross and is set in a 36-foot-deep pit into which you need to descend via stone steps. The Church of St. George is unlike the other ten subterranean churches in Lalibela in that it is not connected to the others by any underground passageway or wadi. Lalibela, considered Ethiopia’s Jerusalem, is the site of a large pilgrimage every year for the Ethiopian Orthodox Christmas that usually takes place in January. Stave churches are carved, wooden churches that were built (without nails) in the Middle Ages in Northwestern Europe. Today, they are mostly found in Norway. The one in the village of Borgund was built around 1180 and is incredibly well preserved. 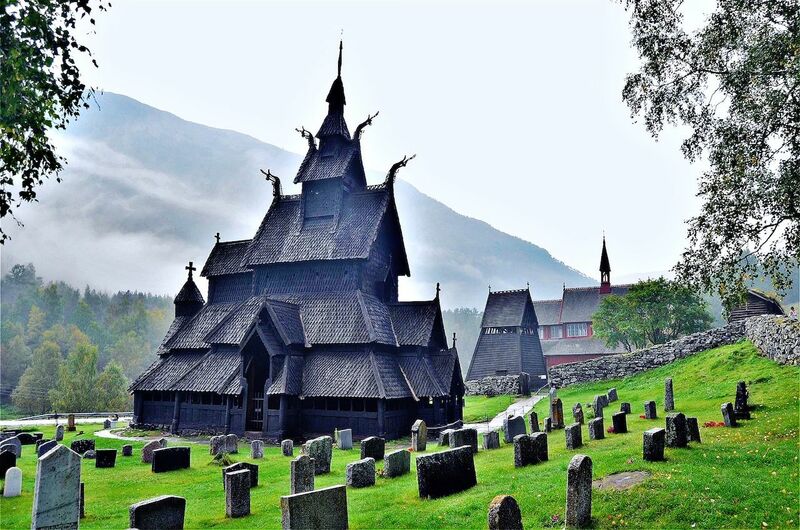 Its tall, timber structure is dark and the roofs are topped with dragon heads that are common in Viking art, so when the sun goes down and the fog sets in, it looks slightly creepy. The fact that the church is surrounded by tombstones doesn’t help. There’s a visitor center located close to the church so you can learn more about stave churches and this particular building. 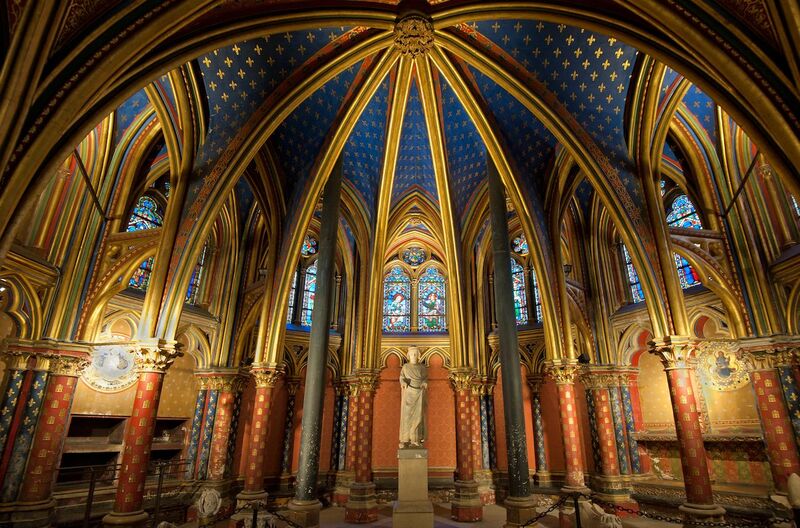 Often in the shadow of Notre Dame de Paris, La Sainte Chapelle is probably the most beautiful church in all of Paris. It’s also only a couple of blocks away from Notre Dame, so you can do both in one day if you’re feeling particularly pious that day. The outside is impressive, but it does not do justice to what’s inside. Every wall is covered with stained glass windows that are 15-meter high and that show 1,113 scenes from the Old and New Testament. 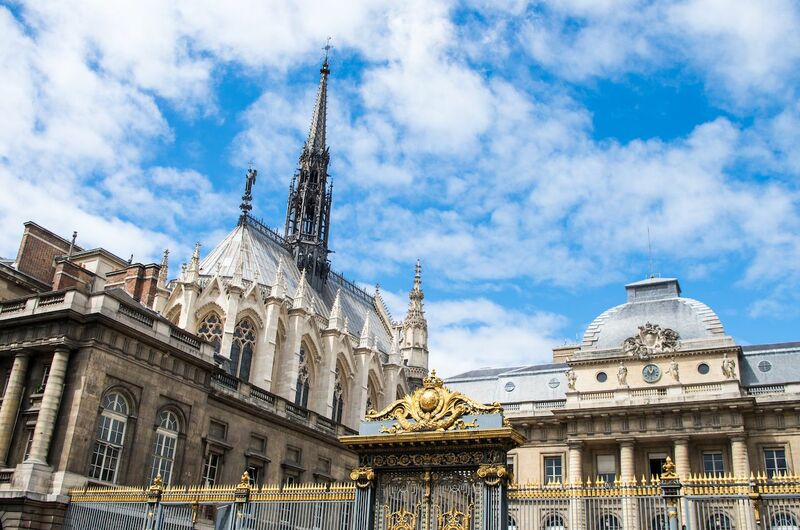 La Sainte Chapelle was built to house the most precious Christian relics, including Christ’s crown of thorns, hence its incredibly ornate decor. The relics are now kept in Notre Dame and the Holy Crown’s authenticity still remains unverified, but that does not take away from the beauty of the this over-the-top reliquary. 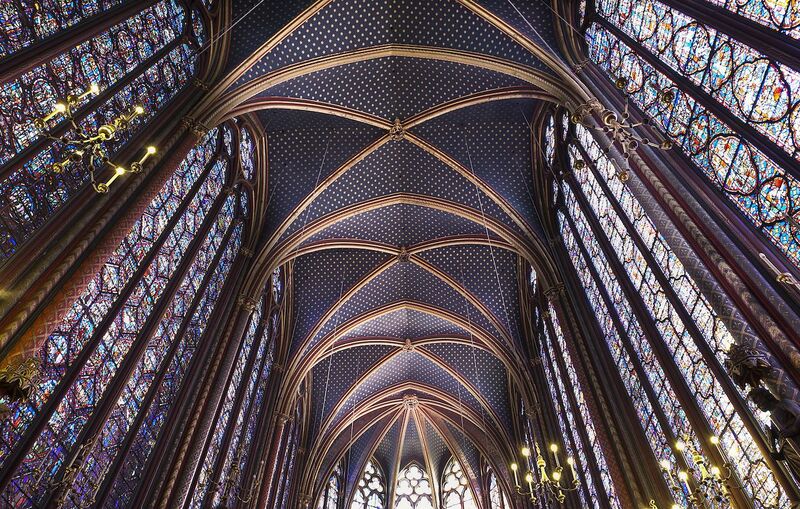 It costs 10 EUR to visit the Sainte Chapelle, but it’s very much worth it. Note that there is an app available that will explain the scenes from the stained glass when you point your tablet or phone camera at them. We suggest you download it before your visit as it will allow you to understand better this gorgeous church. The Saksun Church is proof that less is more. 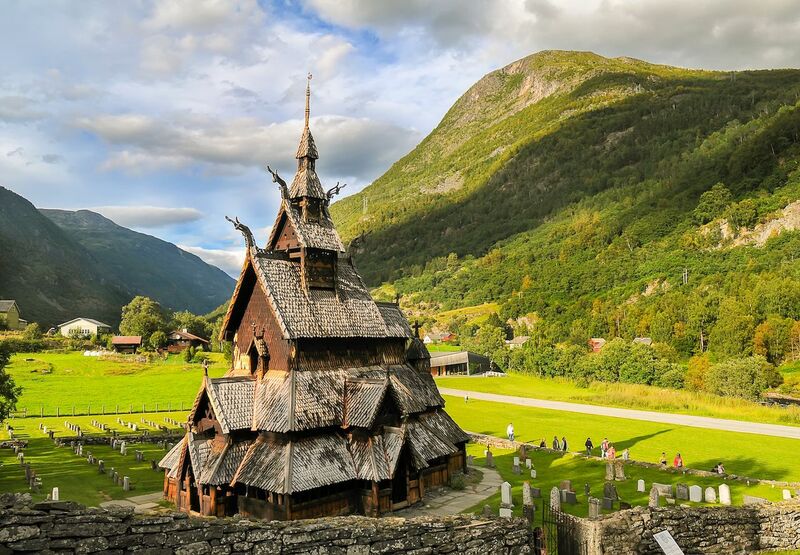 It does not have the incredible carved structure of the Borgund Stave Church or the amazing stained glass of the Sainte Chapelle, but it is stunning by its simplicity and its great surroundings. 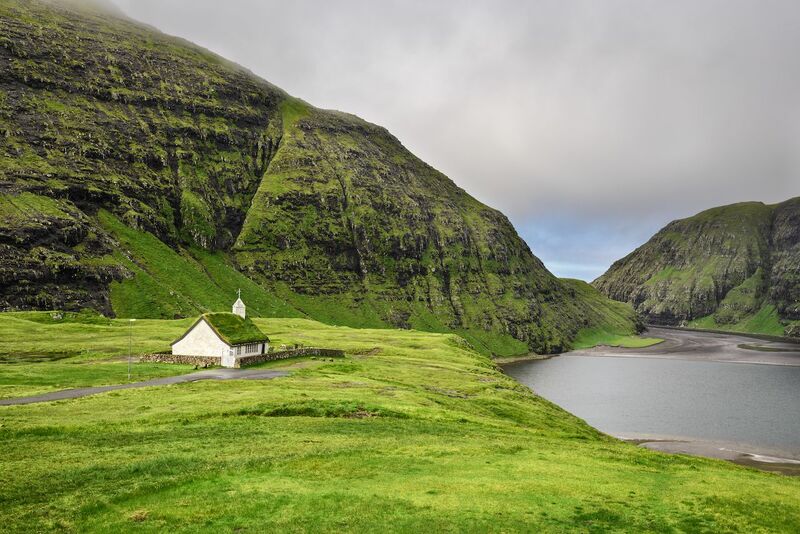 The Saksun Church is located in Saskun, a small village on the northwestern coast of Streymoy, the largest of the Faroe Islands. The village is set in a valley at the bottom of which is a beautiful tidal lagoon. You’d be hard-pressed to find a more peaceful and pristine location. 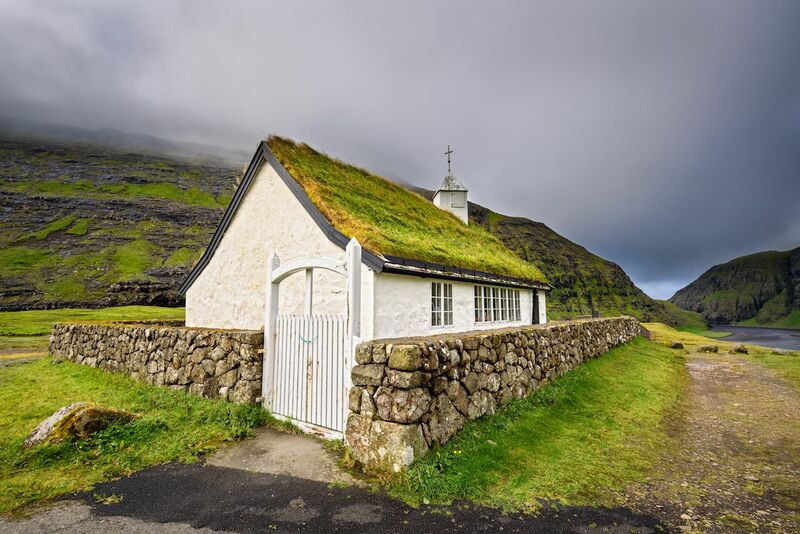 The church itself is a small, white building with a green roof that allows it to blend beautifully with a landscape so green, it almost hurts your eyes. The story goes that the people of Saksun were tired of walking 27 km to Tjørnuvík to go to church, so in 1858, the church in Tjørnuvík was taken down carefully, carried all the way to Saksun, and rebuilt (with stones instead of wood) there. Mass is held every Sunday at 11:00 AM when the local priest is present. When he isn’t, a church prayer is organized instead. Note that you can get married in Saksun Church (imagine the wedding pictures! ), but you’ll have to organize this with the priest. From the outside, Temppeliaukio Church looks like a amphitheatre. It is short, circular, and topped with a dome, so it is nothing like what you’d expect from a European church whose steeples usually dominate the skyline of every town. 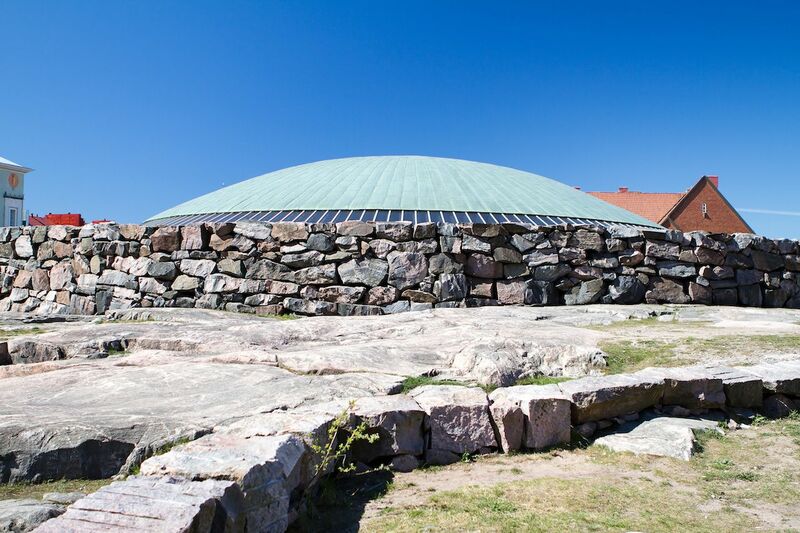 Temppeliaukio Church was dug out of the bedrock and covered with a copper dome that is held by concrete beams. The beams are all separated by windows and are reminiscent of the pipes of church organs (Temppeliaukio Church also has an impressive pipe organ, by the way). They cast beautiful shadows on the wall of the church in the morning, so it may be the best time to visit. 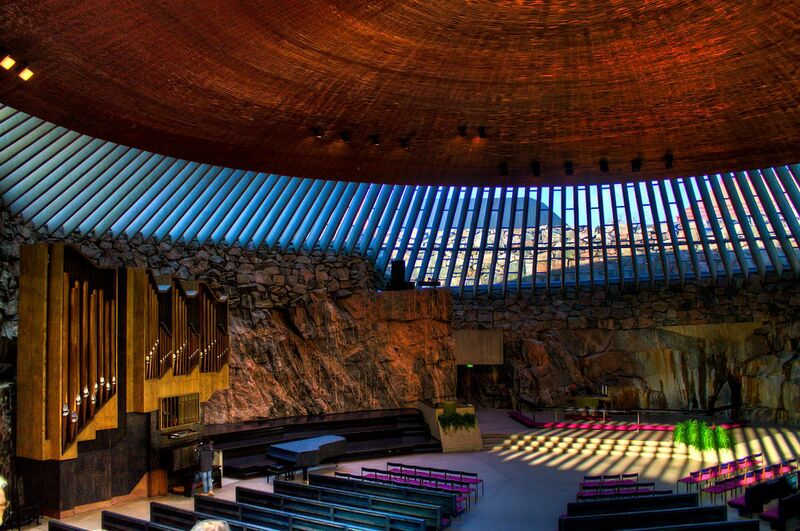 Although the design of the Temppeliaukio Church may look super modern, it was built in 1969 — the Finns are just very avant-garde when it comes to architecture. A visit to Temppeliaukio Church will set you back only 3 EUR — a very small price to pay to see such an unique-looking church.